50 min. Weston Woods. 2017. $59.95. ISBN 9781338162035. K-Gr 5—This reissued collection of Caldecott Medal-winning classics includes Allan Say's Grandfather's Journey, Barbara Kerley's The Dinosaurs of Waterhouse Hawkins, and Jacqueline Briggs Martin's Snowflake Bentley. Each story features panoramic views of the book's illustrations, and the artwork is complemented by expressive narration, appropriate sound effects, and instrumental background music. (Snowflake Bentley also includes live-action shots of Vermont snowstorms.) The disc includes three bonus interviews with Say, Kerley, and illustrator Brian Selznick (The Dinosaurs of Waterhouse Hawkins). They share insights about how they conducted their research, what primary sources they used, and places they visited for inspiration. Additionally, the learning guides make it easy for teachers and librarians to incorporate these books into their curriculums, thanks to summaries, objectives, and before/after viewing activities. 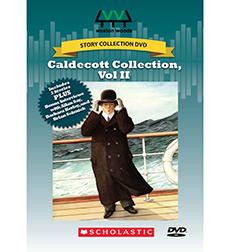 VERDICT These Caldecott favorites, whether shown together or independent of each other, will find a home in many elementary collections, thanks to their stunning artwork, engaging narratives, and informative bonus interviews.